It's photo shoot time this morning. These lovely ladies will be heading off to the Artists Gift Gallery in Dublin City on Saturday so I had to get a few photos before they went. And hopefully I'll get time to type out the pattern this weekend. 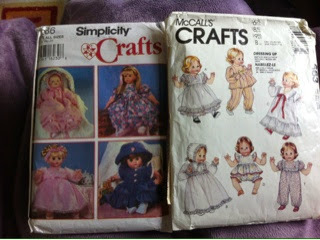 I got some new doll dress patterns in the post today. I can't wait to try them out! And here's some pictures of dresses I've been making this last week - now that my machine has been serviced. 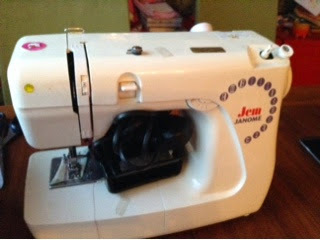 My poor, overworked sewing machine went to the doctors today for a service. The tension had gone hay-wire on it and my attempts to fix it had not worked. This machine has not done me wrong. I have it about 10 years and this was its first service. And it gets quite a bit of use! I had expected to be without it for a few days at least but the guy in the shop had a look at it straight away and had it ready for me within the hour. Now that's service! He even cleaned 10 years of gunk from the top!! Now it's back to sewing. I have a few dolls dresses and doll bodies cut out and ready to go. I just need to find the time to sew now! We're back into the swing of things here after the holidays. 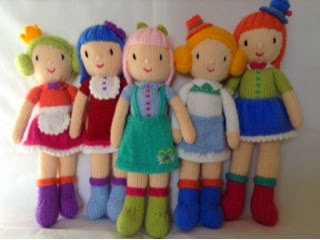 The kids are back to school and after I'm getting the energy back to get stuck into my knitting and sewing. A bad set of markets in November really knocked the wind out of my sails but I feel ready to get back into it properly now. 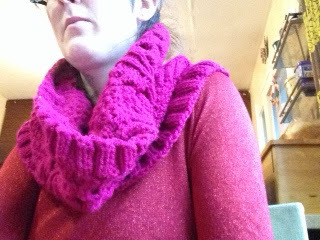 After Christmas I knit a cowl for myself. I found this one on Ravelry. It's a Lion Brand pattern and was supposed to be knit on larger needles and then felted. I only acrylic yarn so I just knit with smaller needles. I've wanted to knit a cowl for myself for ages as I wear scarves all the time and I'm happy with this one. I have a brooch in it at the moment to pull it in a bit tighter as the wind has been bitter here the last few weeks. Next up is a teddy I was commissioned to make. 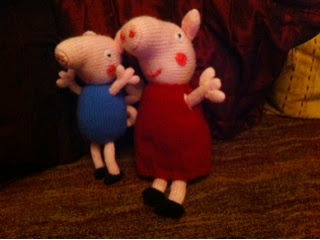 My cousins husband contacted me to make a personalised teddy for my cousin from her 5 month old daughter. It was such a lovely, personal idea and I enjoyed making it.